Estimation is the approximation of a result that one can use even if they are using information that is not clear or is incomplete. It is like making an educated, reasonable guess based on the information given. 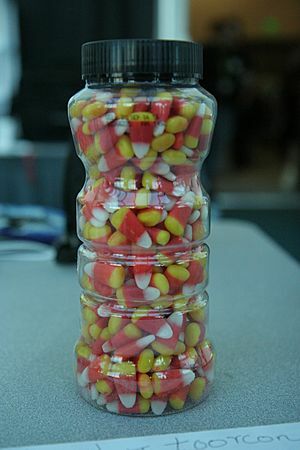 The exact number of candies in this jar cannot be determined by looking at it, because most of the candies are not visible. The amount can be estimated by presuming that the portion of the jar that cannot be seen contains an amount equivalent to the amount contained in the same volume for the portion that can be seen. Estimation is often done by sampling, which is counting a small number of examples something, and projecting that number onto a larger population. An example of estimation would be determining how many candies of a given size are in a glass jar. Because the distribution of candies inside the jar may vary, the observer can count the number of candies visible through the glass, consider the size of the jar, and presume that a similar distribution can be found in the parts that can not be seen, thereby making an estimate of the total number of candies that could be in the jar if that presumption were true. Estimates can similarly be generated by projecting results from polls or surveys onto the entire population. Estimation Facts for Kids. Kiddle Encyclopedia.